Tucked away in the north of Germany, on the banks of the River Stör, is the town of Itzehoe. Despite being one of the oldest towns in the region, Itzehoe is a hotbed of activity for start-up businesses. Boosted by a thriving retail and commercial scene, the town is home to a number of Germany’s leading tech firms. One of Itzehoe’s highlights is the “Feldschmiede” – a pedestrianised area which is lined with a number of shops, bars and restaurants. As part of ongoing works to improve the town’s aesthetic, the local authority decided to replace the aging 1970's wastewater and stormwater infrastructure and combine it with essential upgrades to the area’s broadband cable network. However, rather than a like-for-like replacement they decided to give it a modern – and personal – twist. 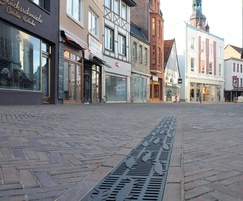 As part of the remedial work, Hamburg-based consultants Kontor Freiraumplanung, worked with the town’s civil engineering department to create an unmistakeable water management grating that reaffirmed Itzehoe’s proud identity. 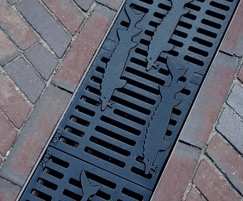 The design honours the River Stör, which flows through the town, and features three sturgeon motifs ‘swimming’ along the channel’s grating. It was created using ACO Freestyle, a design service which enables end-users or architects to create bespoke grating designs, which ACO then manufactures from coated or uncoated ductile iron to sit on ACO drainage channels. 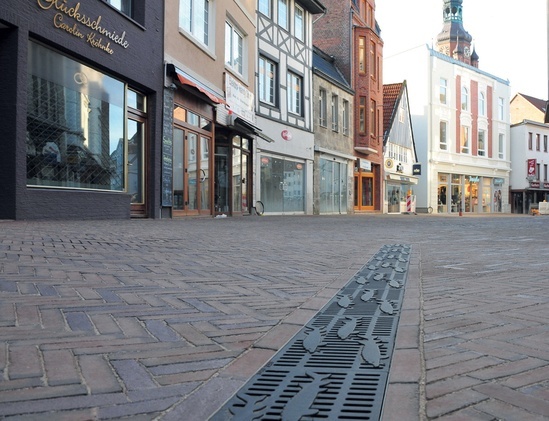 The bespoke ACO Freestyle channels formed part of a new ‘castle street’ style paving along the Feldschmiede, which pays homage to Itzehoe’s twin town of Cirencester in the UK. 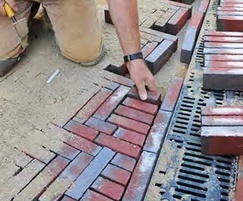 The design comprised of natural clinker bricks laid in a traditional herringbone pattern, interspersed with sleek ACO MultiDrain channels, topped with the town’s ACO Freestyle ‘sturgeon’ grating. The grating was fitted to the ACO MultiDrain channel using ACO’s Drainlock boltless locking system, which is built into the Freestyle grating. The bespoke aesthetic drainage solution seamlessly balances the old with the new, helping the town celebrate and reinforce its cultural identity. Freestyle gratings are available in 100mm to 200mm widths and are built to D400 load classification. The gratings are compatible with MultiDrain channels and the new Multiline Sealin channels, which has an integrated seal for easy installation, as well as a being a tested solution for groundwater protection. ACO Freestyle is perfect for projects where customers want to add an individual finish integrated into the overall design of the building envelope or a whole pedestrianised area.